This delicious and healthy chopped salad is both nourishing and satisfying. With all the colorful vegetables, you know you’re getting lots of important vitamins and minerals. The brown rice adds some energy-providing carbs and the tofu, some plant-based protein. You can also throw in some cashews or peanuts for some crunch. To make the tofu, toss the tofu ingredients together in a bowl then bake on a baking sheet in the oven at 400 degrees for about 30 minutes until browned and crispy, flipping once halfway through (for extra crispiness, see notes on pressing). To make the dressing, add all the dressing ingredients to a blender or food processor, or use and immersion blender and mix until smooth and creamy. 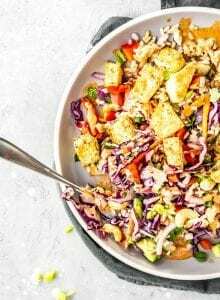 Chop all the veggies and either divide between 4 containers or bowls and top each with equal amounts of rice, tofu and peanut sauce or mix everything together in a large bowl and serve mixed. I like to plate the veggies then top with the rice, tofu and sauce. Serve with fresh lime, tamari and if desired, a pinch of salt and pepper. To press your tofu before baking, fold a dishcloth over it and place something heavy on top of it for 20-30 minutes. If you’re crunched for time, it’s not absolutely necessary but it helps to press out extra water so it can absorb more flavor and get a little crispier. If meal prepping this recipe, I’d suggest storing the veggies and rice in one container and keeping the sauce and tofu separate until serving, or the day you plan to eat it if you’re packing it up an individual container. This is also really good as a hot dish. To make it a peanut stirfry, omit the cucumber then add all the veggies and the rice to a pan, cook for 5-10 minutes then serve with the hot baked tofu and sauce. The veggies don’t have to be exact. If you’re missing anything, no big deal and feel free to play around with the quantities of each.